Your location is not an issue! Maybe you want some advice on how to tackle a cluttered area, or you need help getting motivated and staying motivated? If you think you have the capacity to work on the problem alone, but just don't know where to start, then this service is for you. Maybe you've already experienced the hands-on decluttering service? Now you need advice and support to maintain the area or continue the work elsewhere on your own. Firstly, get in touch and give me a brief description of your problem area. If you can e-mail me a photo of it, that really helps. Then let me have your landline number or Skype contact details. I call you at the appointed time and make suggestions as to how you can tackle your clutter, based on AIDA, my four-point action plan. You will receive an inclusive booklet by e-mail explaining how AIDA works, to help you as you tackle your decluttering. It's easy for you to book a Telephone Consultation. Simply provide me with contact details and an invoice address. Payment must be received before the consultation can go ahead. 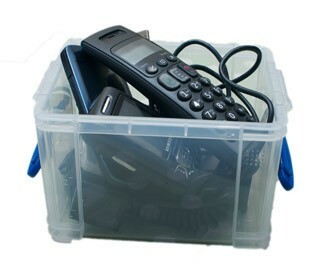 Call me now on 01327 705294 to discuss how telephone consultations can help you tackle your clutter. If you only have access to a mobile phone you will need to make the call to my landline number. One session will be enough if you just need a nudge in the right direction. If you want ongoing support, why not book 3 sessions? This saves you £5 and the sessions can be spaced to suit your schedule. If you require more than three sessions, I will be pleased to quote you.